Susan Daniels OBE, CEO of the National Deaf Children’s Society, received an Honorary Degree of Doctor of Letters. The award was presented during a graduation ceremony at Wolverhampton Grand Theatre in recognition of Susan’s dedicated service to the charity. 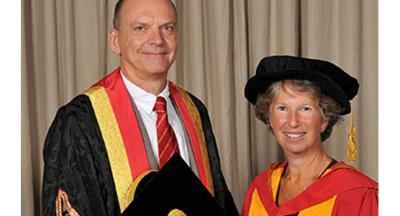 Susan Daniels said: “I am delighted to have received an Honorary Degree from the University of Wolverhampton. Deafness is not a learning disability, yet we know many deaf young people fail to gain a good education. With the right support deaf young people can achieve the same as their hearing peers. Susan Daniels has been Chief Executive of the National Deaf Children’s Society since 1992 and has seen the charity grow from an income of £1 million to over £20 million. She is also CEO of Deaf Child Worldwide, the international development arm of the charity, which is dedicated to enabling deaf children and young people to overcome poverty, inequality and isolation. Susan was a commissioner of the Disability Rights Commission from 2003 until its merger with the Commission for Equality and Human Rights. She was also chair of the UK Council on Deafness, the umbrella body for all organisations working in the field of deafness, which provides information, advice and support to member organisations and represents the views of the sector to government and policy makers. Susan is currently chair of the NHS Newborn Hearing Screening Programme Quality Assurance Advisory Group, which monitors the delivery of the programme across hospitals in England. She is co-chair of the NHS Strategic Hearing Aid Procurement Group – the NHS being the largest purchaser of hearing aids worldwide. Susan is chair of Groundbreakers, an informal networking group for women leaders in the voluntary sector, which includes CEOs from organisations which range in profile from large national and international to smaller local and community based. In 2006, Susan was awarded an OBE for services to deaf children and their families. The award was presented by the University’s Faculty of Social Sciences on Friday, 5 September 2014. Picture: Susan Daniels, pictured with Professor Geoff Layer, Vice-Chancellor of the University of Wolverhampton, receiving her honorary award.